Depiction of Burnham and Armstrong after the assassination of Mlimo. Ndebele warriors in hot pursuit, drawn by Frank Dadd. In March 1896, the Ndebele revolted against the authority of the British South Africa Company in what is now celebrated in Zimbabwe as the First Chimurenga. The Mlimo (or M'limo, or Umlimo) the Ndebele spiritual leader, is credited with fomenting much of the anger that led to this confrontation. He convinced the Ndebele and the Shona that the settlers (almost 4,000 strong by then) were responsible for the drought, locust plagues and the cattle disease rinderpest ravaging the country at the time. The Mlimo's call to battle was well-timed. Only a few months earlier, the British South Africa Company's Administrator General for Matabeleland, Leander Starr Jameson, had sent most of his troops and armaments to fight the Transvaal Republic in the ill-fated Jameson Raid. This left the country nearly defenceless. The British immediately sent troops to suppress the Ndebele and the Shona, but it cost the lives of many on both sides. Months passed before the amount of British forces were adequate to break the sieges and defend the major settlements, and war raged on until October of the following year. The Mlimo planned to wait until the night of 29 March, the first full moon, to take Bulawayo by surprise immediately after a ceremony called the Big Dance. He promised, through his priests, that if the Ndebele went to war, the bullets of the settlers would change to water and their cannon shells would become eggs. His plan was to kill all of the settlers in Bulawayo first, but not to destroy the town itself as it would serve again as the royal kraal for the newly reincarnated King Lobengula. The Mlimo decreed that the settlers should be attacked and driven from the country through the Mangwe Pass on the Western edge of the Matobo Hills, which was to be left open and unguarded for this reason. Once the settlers were purged from Bulawayo, the Ndebele and Shona warriors would head out into the countryside and continue the slaughter until all the settlers were either killed or had fled. However, several young Ndebele were overly anxious to go to war, and the rebellion started prematurely. On 20 March, Ndebele rebels shot and stabbed a native policeman. Over the next few days, other outlying settlers and prospectors were killed. Frederick Selous, the famous big-game hunter, had heard rumours of settlers in the countryside being killed, but he thought it was a localised problem. When news of the policeman's murder reached Selous on 23 March, he knew the Ndebele had started a massive uprising. Nearly 2,000 Ndebele warriors began the rebellion in earnest on 24 March. Many, although not all, of the young native police quickly deserted and joined the rebels. The Ndebele headed into the countryside armed with a variety of weapons, including: Martini-Henry rifles, Winchester repeaters, Lee-Metfords, assegais, knobkerries and battle-axes. As news of the massive rebellion spread, the Shona joined in the fighting, and the settlers headed towards Bulawayo. Within a week, 141 settlers were slain in Matabeleland, another 103 killed in Mashonaland, and hundreds of homes, ranches and mines were burned. Ndebele warrior. Sketch by Robert Baden-Powell. 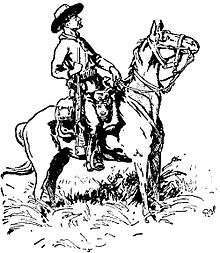 Rather than wait passively, the settlers immediately mounted patrols, called the Bulawayo Field Force, under such figures as Selous and Frederick Russell Burnham; these rode out to rescue any surviving settlers in the countryside and went on attack against the Ndebele. 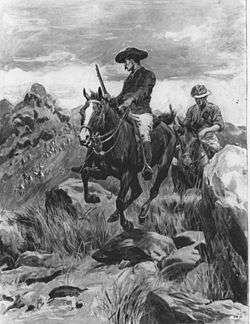 Selous raised a mounted troop of forty men to scout southward into the Matobo Hills. 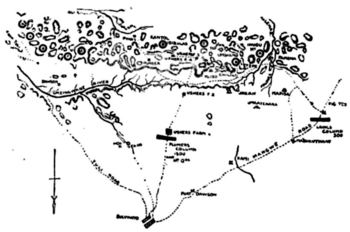 Maurice Gifford, along with 40 men, rode east along the Iniza River. Whenever settlers were found, they were quickly loaded into their wagons and closely guarded on their way to Bulawayo. Within the first week of fighting, 20 men of the Bulawayo Field Force were killed and another 50 were wounded. In the First Matabele War, the Ndebele had experienced the effectiveness of the settlers' Maxim guns, so they never mounted a significant attack against Bulawayo even though over 10,000 Ndebele warriors could be seen near the town. Conditions inside Bulawayo, however, quickly became unbearable. During the day, settlers could go to homes and buildings within the town, but at night they were forced to seek shelter in the much smaller laager. Nearly 1,000 women and children were crowded into the city, and false alarms of attacks were common. Although they kept up their siege, the Ndebele made one critical error: they neglected to cut the telegraph lines connecting Bulawayo to Mafeking. This gave both the relief forces and the besieged Bulawayo Field Force far more information than they would otherwise have had. With the siege broken, an estimated 50,000 Matabele retreated into their stronghold of the Matobo Hills near Bulawayo. This region became the scene of the fiercest fighting between the settler patrols and the Matabele. By June, the Shona kept their promise and joined the fighting on the side of the Ndebele. But lacking a clear leader similar to Mlimo, the Shonas mostly stayed behind their fortifications and conducted few raids. Rhodes makes peace with the Ndebele in Matobo Hills, 1896. Sketch by Robert Baden-Powell. After the assassination, overseas press hailed Burnham and Armstrong as "heroes of the British Empire." But in Rhodesia, sections of the press were sceptical about the assassination of the Mlimo. It had been a mistake on the part of British military intelligence to think of the Mlimo and the high priest, or prophet, in the Matopos as one in the same. Based on British Army reports, Carrington believed that the Mlimo was a central authority and that "his orders fly about from one end of the country to another with great rapidity". Historian Terence Ranger writes that "Carrington was almost certainly over-estimating the centralization (of the Mlimo)", and that "Baden-Powell and other reporters tended to run the various shrines in the Matopos into one". Frederick Selous believed that the head priest of the Mlimo lived in the Matopos, but that "there are other priests, or so-called Umlimos, in other parts of the country through whom they believe that the commands of the Almighty can be conveyed to them." Burnham had carried out his instructions from Carrington and, like Carrington, he relied heavily on Armstrong and military intelligence for his information. Armstrong, the instigator and active participant in the operation, "was an authority on the Native, his language, customs and mentality", according to fellow native commissioner E.C. Harley. Armstrong was also a Major in the Mangwe Field Force, and Selous describes him as young, but "shewd and capable". Selous and Harley say that Armstrong was in command at the Mangwe laager, although Baden-Powell and other sources name van Rooyen and Lee as the commanders. Some writers also describe Armstrong as young and moody and claim that he too expressed doubts about the identity of the man killed, but only after the assassination. Initially the Company declined to review the matter and Burnham left Rhodesia on 11 July 1896, a week after the Bulawayo Field Force disbanded, to join the Klondike Gold Rush. However, at Armstrong's insistence a court of inquiry was later appointed to investigate the assassination. [n 1] Although several writers have commented on the outcome, the official report itself has been lost. Referring to the court's report, Harley writes, "The finding of the Judge (Watermeyer) was that the native killed was the Chief Priest of the M'limo. Whether there was another occult personage associated with the M'limo deception is problematical, for with the death of the Chief Priest, the M'limo deception also died." But historian Hugh Marshall Hole writes, "On their return they were greatly applauded for having achieved their dangerous errand, but some time later, when it was found that Mlimo was still at work, an official inquiry was held, with the result that the whole affair was exposed as an elaborate hoax." In contrast to Hole, historians Mary and Richard Bradford, Mary Clarke, Peter Emmerson, and Jack Lott all agree with Harley that the court of inquiry favoured Armstrong. Emmerson cites an 1899 report from chief native commissioner H.J. Taylor as evidence that Watermeyer ruled in favour of Armstrong. Mary and Richard Bradford studied Taylor's 1899 report, and Hole's correspondence, and they suggest specific errors made by Hole in his interpretation of Taylor's report. Clarke and Lott both point out that Armstrong was given a gold watch and a letter of appreciation from the Board of the British South Africa Company after the verdict was rendered. While there appears to be no clear consensus about either the identity of man assassinated in the Matopos or his role, historian Howard Hensman states "With the downfall of Wedza and shooting of the M'Limo in a cave in the Matoppos by the American scout, Burnham, the Matabele rebellion may be said to have come to an end." Upon learning of the death of Mlimo, Cecil Rhodes walked unarmed into the Ndebele stronghold and persuaded the Ndebele warriors to lay down their arms. With the war in Matabeland effectively over, the Bulawayo Field Force disbanded on 4 July 1896. With regard to the regular forces under Carrington, Hensman writes "As the rainy season approached and peace was arranged in Matabeleland, the forces, or a considerable potion of them, were moved up into Mashonaland". The rebellion failed completely and did not result in any major changes in BSAC policy. For example, the hut tax which remained in place. The territories of Matabeleland and Mashonaland had become Rhodesia, and both the Ndebele and Shona became subjects of the Rhodes administration. However, the legacy of leaders such as Kaguvi, Mapondera and Nehanda was to inspire future generations. Soon after the outbreak of the war, Baden-Powell was assigned to Matabeleland as Chief of Staff to Gen. Carrington and it was here that he first met and began a lifelong friendship with Frederick Russell Burnham, the American-born Chief of Scouts for the British. This would become a formative experience for Baden-Powell not only because he had the time of his life commanding reconnaissance missions into enemy territory, but because many of his later Boy Scout ideas took hold here. Burnham had been a scout practically his entire life in the United States when he went to Africa in 1893 to scout for Cecil Rhodes on the Cape-to-Cairo Railway. As Chief of Scouts under Major Allan Wilson, Burnham became known in Africa as he-who-sees-in-the-dark and he gained fame in the First Matabele War when he survived the British equivalent of Custer's Last Stand, the infamous Shangani Patrol. During their joint scouting patrols into the Matobo Hills, Burnham began teaching Baden-Powell woodcraft, inspiring him and giving him the plan for both the programme and the code of honour of Scouting for Boys. Practised by frontiersmen of the American Old West and Indigenous peoples of the Americas, woodcraft was generally unknown to the British, but well known to the American scout Burnham. These skills eventually formed the basis of what is now called scoutcraft, the fundamentals of Scouting. Both men recognised that wars in Africa were changing markedly and the British Army needed to adapt; so during their joint scouting missions, Baden-Powell and Burnham discussed the concept of a broad training programme in woodcraft for young men, rich in exploration, tracking, fieldcraft, and self-reliance. It was also during this time in the Matobo Hills that Baden-Powell first started to wear his signature campaign hat like the one worn by Burnham, and it was here that Baden-Powell acquired his Kudu horn, the Ndebele war instrument he later used every morning at Brownsea Island to wake the first boy scouts and to call them together in training courses. In his will, Rhodes directed that he be buried in the Matobo Hills; when he died in the Cape in 1902 his body was brought to Bulawayo by train. His burial was attended by Ndebele chiefs, who asked that the firing party not discharge their rifles, as this would disturb the spirits. Then, for the first and probably the only time, they gave a white man the Ndebele royal salute "Bayete". Rhodes is buried alongside Jameson and the 34 settler soldiers killed in the Shangani Patrol. ↑ No date is given for the court of inquiry, presided by Judge Watermeyer. However, it must have met sometime after Burnham left Rhodesia since he does not mention it in his memoirs or his letters, historians referenced in this article do not comment on his having participated, and after he left for the Klondike Gold Rush, Burnham did not return to Africa until the Second Boer War when Lord Roberts asked him to join his headquarters staff on the recommendation of Carrington. Baden-Powell was likely in Rhodesia at the time of the Watermeyer inquiry, but he too does not mention it and historians referenced in this article do not mention his having participated. ↑ Mario, Prince (2009). Zimbabwe, Land and the Dictator. 1 2 Selous 1896, pp. 15–17. 1 2 Burnham 1926, p. 249. 1 2 Burnham 1926, p. 250. ↑ Burnham 1926, p. 251. ↑ Baden-Powell 1896, pp. 80–82. 1 2 Burnham 1926, pp. 249–258. ↑ New York Times 1896. ↑ van Wyk 2003, pp. 242–243. ↑ Clarke 1983, p. 42. ↑ Clarke 1983, pp. 40–51. ↑ Ranger 1966, p. 105. 1 2 3 Ranger 1966, pp. 105–106. ↑ Selous 1896, pp. 15. ↑ Lott 1976, pp. 43–47. 1 2 Clarke 1983, pp. 43. 1 2 Selous 1896, p. 114. 1 2 Clarke 1983, pp. 39. ↑ Baden-Powell 1896, p. 11. ↑ Clarke 1983, pp. 40–46. ↑ Bradford 1994, p. xxiv. 1 2 Clarke 1983, pp. 44, 46. 1 2 3 Bradford 1994, p. xxiii. ↑ Clarke 1983, p. 45. ↑ Hole 1926, p. 367. ↑ Clarke 1983, pp. 46. 1 2 3 4 5 Emmerson & 1975 Forward. 1 2 3 4 Lott 1976, pp. 46. ↑ Bradford 1994, pp. xxii-xxiii. ↑ Clarke 1983, pp. 43-45. ↑ Clarke 1983, p. 47. ↑ Clarke 1983, p. 48. ↑ Ranger 1966, p. 106-107. ↑ Ranger 1967, pp. 185, 397. ↑ Bradford 1994, pp. xxiii-xxiv. ↑ Hensman 1900, p. 232. ↑ Selous 1896, pp. 239. ↑ Hensman 1900, p. 242. ↑ Pena, L. 2000. The Revolt of the Zimbabwean Masses: Part 1: How Did it Begin? ↑ Beach, D.N. 1970. Afrikaner and Shona Settlement in the Enkeldoorn Area, 1890–1900. Zambezia, 1, 5–34. ↑ Maritz, J. 1989. Towards a Zimbabwean Aeneid: a pedagogical exercise. Zambezia, 16, 151–157 . ↑ Lott, Jack (1981). "Chapter 8. The Making of a Hero: Burnham in the Tonto Basin". In Boddington, Craig. America – The Men and Their Guns That Made Her Great. Petersen Publishing Co. p. 90. ISBN 0-8227-3022-7. ↑ West, James E.; Peter O. Lamb; illustrated by Robert Baden-Powell (1932). He-who-sees-in-the-dark; the boys' story of Frederick Burnham, the American scout. Brewer, Warren and Putnam. ↑ DeGroot 1944, p. 6. ↑ Baden-Powell 1908, p. xxiv. ↑ Orans, Lewis P. "The Kudu Horn and Scouting". PineTree Web. Retrieved 28 July 2010. ↑ Forster, Reverend Dr. Michael. "The Origins of the Scouting Movement" (DOC). Netpages. Retrieved 2 October 2007. ↑ Maylam, Paul (2005). The cult of Rhodes: remembering an imperialist in Africa. Claremont, South Africa: David Philip Publishers. ISBN 0-86486-684-4. ↑ Norman, Andrew (2004). Robert Mugabe and the Betrayal of Zimbabwe. Jefferson, N.C.: McFarland & Company. ISBN 0-7864-1686-6. Lott, Jack (1981). "Chapter 8. The Making of a Hero: Burnham in the Tonto Basin". In Boddington, Craig. America— The Men and Their Guns That Made Her Great. Los Angeles, California: Petersen Publishing. ISBN 978-0-8227-3022-4. Ranger, Terence (1966). "Chapter 5. The Role of the Ndebele and Shona Religious Authorities in the Rebellions of 1896 and 1897". In Stokes, Eric; Brown, Richard. The Zambesian Past: Studies in Central African History. Manchester: Manchester University Press.